Timber products are popular with designers and builders due to the combination of aesthetics and versatility in application that timber provides. When correctly installed, timber products are both durable and reliable in function. A series of installation guides have been produced to provide designers with an understanding of planning requirements when using timber in construction and offer installers information that ensures correct installation to maximise the service life of the products. 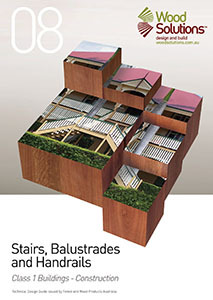 Guide 8 - Stairs, balustrades and handrails class 1 Buildings - construction - this guide covers construction of timber stairs with straight flights, with or without risers, for external and internal use and balustrades. 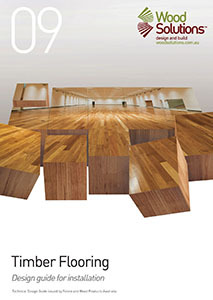 Guide 9 - Timber flooring - design guide for installation - provides information about installing solid timber strip flooring over bearers and joists, timber-based sheet flooring products and concrete slabs. Guide 10 - Timber windows and doors - a comprehensive guide to designing and specifying timber windows and doors. Hard copies of most WoodSolutions guides are available for purchase from SAI Global. This guide is intended to be used for the design, practices and construction of timber stairs, handrails and balustrades. Information about both internal and external stairs is provided. Also, both open stairs (no risers) and closed stairs (with risers) are catered for. 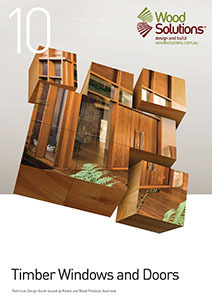 Recommendations are also provided on timber species selection, durability and finishing etc., and example stair calculations are given in Appendix B and C.
This publication provides a reference guide for the installation of solid timber strip flooring over bearers and joists, timber-based sheet flooring products and concrete slabs. Generally, floors of this type are of solid timber or a laminated product made from layers of timber, bonded together. Flooring fits together with a tongue and groove joint. After the flooring is in place, the floor is sanded and finished. There areother timber flooring products that are not of this type and are not covered by this guide. These include parquetry, pre- finished floors and ‘floating’ timber floor systems. When installing a strip timber floor, many aspects must be considered, including the house design, environment in which the floor is to be laid and the desired appearance of the finished floor. Such aspects influence the choice of species, cover width, fixings and finish to be applied. Information relating to product selection, assessing the installation environment, floor installation, sanding and finishing are provided in the guide, together with additional information of importance to the floor installer, sander and finisher. The building design and construction communities are increasingly aware of the need to consider thermal performance and environmental impact in the design and construction of buildings. This has increased demand for high-performance windows and doors that limit energy use in service and reduce greenhouse gas emissions associated with material production, fabrication and building construction (embodied carbon).